What do I want to be when I grow up? Everyone asks themselves this question when they’re young. Unfortunately, since not everyone can be a princess or a cowboy, we invited the children of our employees and their friends to our internal Girls & Boys’ Day to give them some introduction and insight into a variety of professions within our company. Most of the children already knew where their mum or dad work, but only a few of them knew anything about the actual tasks they undertook every day. 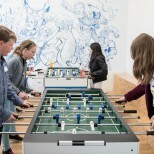 Colleagues across different departments put together exciting workshops to give the 11 to 14-year-old girls and boys an idea of the wide range of activities going on here. From programming exercises to user-friendly tests for our games, to artistic logo designs – our young participants were treated to a diverse program. Tom-Henry from our server development department used a programming puzzle to demonstrate some of the basic concepts that go into programming and gave every child a chance to prove their coding skills on a laptop. Individual building blocks with commands had to be arranged in the proper order so that the figure on the screen moved in the right direction. This activity challenged the children’s ability to think logically. 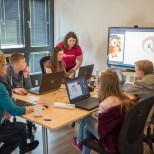 For their artistic side, our creativity workshop offered the participants a variety of different activities to try: with Jenny, one of our vector artists, the group learned how to build a vector graphic of a peacock chick for our game Big Farm. The final designs were printed out so that every child could take home a beautiful souvenir of the day. Julian from our corporate art team offered a different kind of creative task. He set up a small photography workshop where the participants could photograph each other. With tips from Julian, the kids shot professional portraits and saved a digital copy onto a flash drive to take home. Esther, who also works in our corporate art team, gave an introduction to event design, using our last company party as an example. Esther described the process of designing posters showing childhood heroes and also went through the steps of creating a logo. The children learned about a completely different kind of job in our usability laboratory. This is where we test the user friendliness of our games. Joshua from our UX team explained the procedures and mechanisms behind these tests, as well as why they are important for our products. Lisa from our onboarding team explained what kind of support our international employees receive before and after starting in our company, since we have employees of more than 60 different nationalities who have moved to Hamburg just to work here. The children learned about cultural differences by thinking up typical German traits and comparing them with the traits that are typical in other countries. By late that afternoon, all of the 16 children had passed through the workshops and accepted their participation certificates with pride. We’re pleased that this event provided us with an opportunity to give the children a variety of insights into our company and maybe even start them on the path to their future careers. We hope that one day we can welcome one or more of the participants as colleagues at Goodgame Studios!